Description: This handsome, functional desk was custom designed and hand crafted for clients in Newport Beach, CA. The clients requested an award winning piece that would last for generations to come, something beautiful enough that their children might fight over. Made from richly colored Peruvian Walnut and highly figured California Claro Walnut, and constructed using dovetail joints for strength and timeless beauty. The secretary top is composed of 46 pieces and joined with 110 dowel pins. The unusual, elegant hinge hides a solid aluminum rod. Included in the back panel is a small, hinged door for computer and phone access. Precision rabbet and dado joints for a snug, smooth fit were used on the drawers. Concealed locks were added to the lower drawers for added security. The tailor made openings on the drawers/doors give this desk a custom look. Included is an organizer created for efficiency and storage. The bottom cabinet has two adjustable shelves with concealed brass pins. 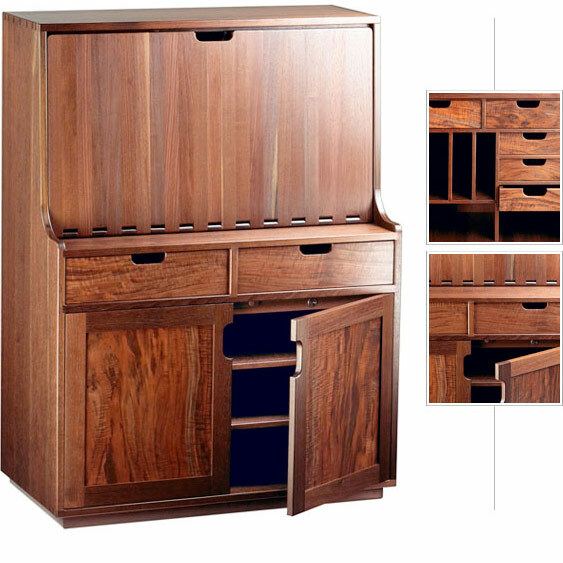 The exceptional craftsmanship is completed with beautiful, sturdy joinery and a satin smooth finish.